Eileen MacDonagh was born in Co.Sligo and has worked as a sculptor since the early 1980s. Her work has featured in many exhibitions, both in Ireland and abroad, including shows in Portugal, Scotland, India and Japan.Eileen has both organised and participated in many symposia, in Ireland and abroad; her work is included in numerous collections, such as the OPW, Kilkenny and Cork County Councils, Marlay Park, Dublin and Tawara Newtown, Osaka, Japan. ‘Eileen MacDonagh’s sculptures are candid, direct and ultimately rational. They spring from a harmonious and human-centered vision which seeks to charge natural materials with an aesthetic significance governed always by principles of clarity and formal coherence. Their major analogues derive from architecture and from craft… though never minimalist, the sculptures can sometimes be minimal, working to achieve a sort of meditative stillness where every details counts. Medh Ruane. MacDonagh’s work has featured in many exhibitions, both in Ireland and abroad, including shows in Portugal, Scotland, India and Japan. Eileen has both organised and participated in the International Sculpture Symposium movement, in Ireland and abroad; her work is included in numerous collections, such as the Irish Office of Public Works (OPW), the Lough Boora Sculpture in the Parklands, Co. Offaly, Kilkenny and Cork County Councils, Marlay Park, Dublin and Tawara Newtown, Osaka, Japan. 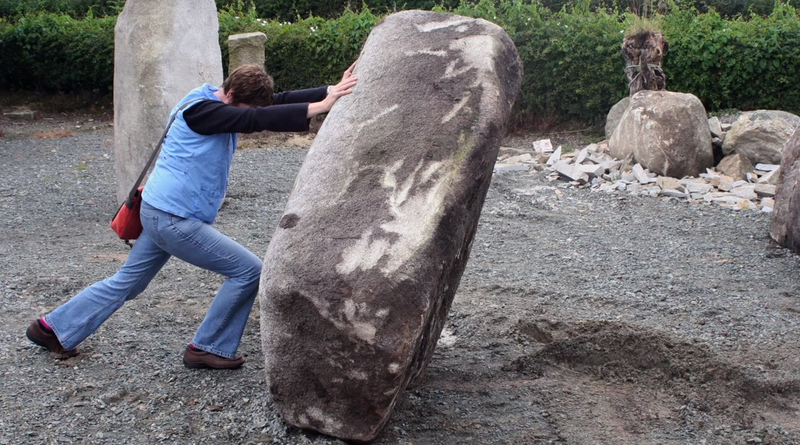 MacDonagh works mainly in stone to produce large scale sculptures. Due to the scale of her work, she has tended to concentrate on Public Art Commissions although she has also exhibited in the context of the gallery exhibitions. She received a Diploma in Sculpture at the School of Art, Regional Technical College, Sligo, Ireland (1974–79) and an Art Teachers Certificate from the Limerick School of Art & Design (1979–80). MacDonagh’s first solo exhibition in 1992,Truss, showed large scale works made from both wood and stone. MacDonagh has continued through her career as a sculptor taking on large scale projects, and has built up a large body of public art since across Ireland and in other countries. ‘when MacDonagh talks about granite and limestone her language takes on a new dimension, introducing the listener to colour, texture, density and ultimately to the processes that working with them involve. ‘Granite is the noblest of stones’, she says, ‘just the toughness of it. Every time you strike the stone you make fire. Granite is volcanic, it was born of fire and you need fire to form it.’ She loves the challenge of working on a large scale, coaxing her vision out of unyielding, resistant stone. The circularity of the process, appeals to her sense of the invisible order that is a hall-mark of her work’. .
MacDonagh is deeply influenced by books such as Robert Lawlor’s Sacred Geometry and Fritjof Kapra’s The Tao of Physics in which formal patterns are linked to ideas, religions and to the physical make-up of the universe. 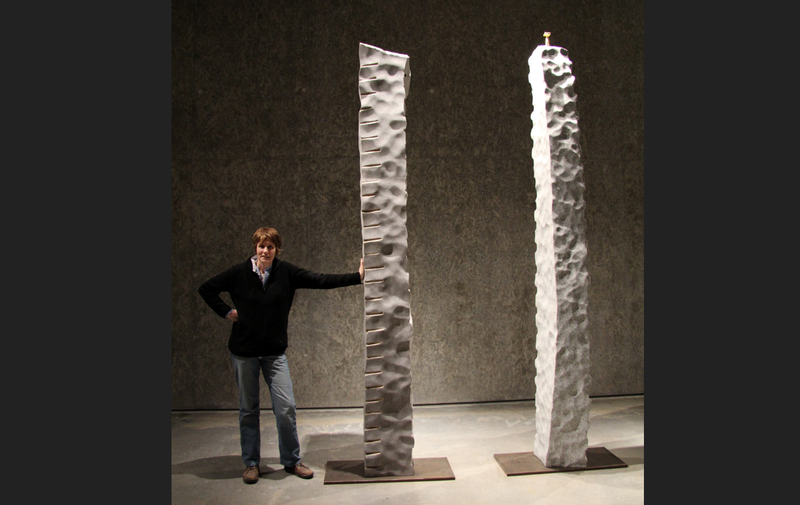 She has investigated the colour, texture and density of granite and limestone, as well as the challenge of working on a large scale. In recent years she has undertaken large scale public works in stainless steel – The Medusa Tree (2009) for VISUAL, The Contemporary Art Centre, Carlow and – The Tallaght Cross (2008). Many of MacDonagh’s sculptures examines a fascination with geometry. She has long been inspired by the purity and ubiquity of geometric principles and the way in which geometric rules govern the universe. Her 2008 Fire from Stone show at the Centre culturel irlandais featured four major installations, the largest of which was composed of fifteen pieces of differing size. The individual pieces were based on icosohedral forms, a complex geometric shape, and are carved from over ten different types of Indian granite. They ranged in size from 4 foot in diameter to just 4 inches, and were all created when MacDonagh was on a residency in India.